Growing up in sunny South Africa, she was initiated in the twilight tribe . . . she knows firsthand why the region birthed such a sound. Stomping her way through Johannesburg’s starry nights, she sought the sun, and as the dawn broke through one morning, NYX was reborn. With a lifelong love kindled, she carried her passion across the long waters to Vancouver, pursuing a better balance of night and light. Finally, NYX found the infamous Alluvium festival, and knew she had found her true musical family. 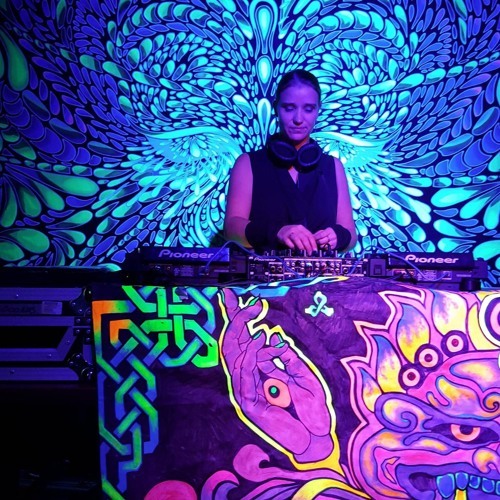 Since then, NYX has shared the stage with the likes of Space Tribe, Mad Maxx, Rubix Qube, Goa Pete, Highstyle, Flipnot (Parvati Records), Dala, Distorted Thought, Blue Lunar Monkey, Solitare, and many others. An adamant acolyte of the straight 148, NYX may still play coy, soft and sweet, seducing you with soft strings and trippy textures. She may punish with pulsing bass or dazzle with swirling synths, guiding you through till morning with stars in your eyes. Please welcome NYX of the Night.